If you have been arrested in Cinnaminson Township, New Jersey for criminal charges or a DWI, it is important to consult with an experienced criminal defense lawyer about how best to handle your case. The criminal defense attorneys at our criminal defense law firm have the knowledge and experience to help you successfully resolve charges for possession of marijuana, drug paraphernalia, simple assault, disorderly conduct, and other disorderly persons offenses in Cinnaminson, NJ. Attorney William C. Fay has been fighting for the rights of clients charged with criminal offenses and DUI for years. His career as a former New Jersey Deputy Attorney General informs the highly effective strategies he now uses to get clients’ charges dismissed, downgraded, and otherwise resolved in the best way possible. When you need a legal advocate who will thoroughly investigate your case and employ the best defense strategies to achieve a favorable result, William Fay and his team are the ones you want on your side. To speak with a Cinnaminson Township criminal defense lawyer today, contact our office at 609-832-3202. We provide absolutely free consultations. Cinnaminson is a township in Burlington County, New Jersey that borders the Delaware River and is considered a suburb of Philadelphia. According to the last U.S. census, the population of Cinnaminson Township was just over 15,500. Cinnaminson has a total area of approximately 8 square miles and it contains over 80 miles of roadways. Although one might expect this suburb to have little police activity, there are numerous arrests and criminal charges in the township every year. Some of the most common offenses in Cinnaminson include: criminal mischief, shoplifting, possession of CDS in a motor vehicle, underage drinking, driving while intoxicated (DWI), and driving under the influence (DUI). When a person is charged with a disorderly persons offenses (similar to a misdemeanor) in Cinnaminson, their case is sent to the Cinnaminson Township Municipal Court. Disorderly persons offenses in New Jersey may result in a sentence to serve up to 6 months in the county jail, a fine of $1,000, and a criminal record. Some disorderly persons offenses are also punishable by community service, driver’s license suspension, and restitution payments. Regardless of the disorderly persons offense you have been charged with, a conviction will leave a permanent mark on your criminal record. You can only apply for an expungement of a DP offense after five years have passed. Drunk and drugged driving charges are also heard and decided in Cinnaminson Municipal Court. The specific penalties for a DWI depend on several factors, including any prior DUI convictions, your blood alcohol concentration (BAC) at the time of the offense, if you refused to provide a breath sample, or if you were arrested for DWI in a school zone. Indictable crimes (felony offenses) that occur in Cinnaminson are transferred to the Burlington County Superior Court in Mount Holly, NJ. If you are required to appear in Cinnaminson Township Municipal Court, here is some information about the court for your convenience. 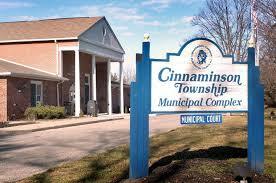 Cinnaminson Municipal Court is located at 1621 Riverton Road, Cinnaminson, NJ 08077. Court hours of operation are Monday through Friday from 8:30 am to 4:00 pm. The court can be contacted by phone at 856-829-4027. The fax number is 856-829-2893. As for important court personnel, the Presiding Municipal Court Judge is Honorable Richard E. Andronici, JMC. The prosecutor is Daniel Gee, Esq. The court administrator is Dana Aldrich and the deputy court administrator is Bridget Gentile. Court sessions are help the first Monday of every month at 12:00 pm, the third Tuesday of the month at 8:30 am, and the fourth Tuesday of the month at 5:00 pm. For more information, visit the Cinnaminson Municipal Court website. For more information about the Township of Cinnaminson in Burlington County, NJ, access their official website. The Cinnaminson Police Department is located at 900 Manor Road, Cinnaminson, NJ 08077. For non-emergency calls, dial 856-829-6667. To read more about the Cinnaminson PD, access this page. To read news and recent happenings in and around Cinnaminson, check out the Cinnaminson Patch. If you have been charged with a criminal offense or pulled over for a traffic violation in Cinnaminson, NJ, our criminal defense law firm can help. Contact us at 609-832-3202 for a free consultation. Our attorneys have handled numerous cases in Cinnaminson Municipal Court and Burlington County Superior Court and we will put that experience to work for you.